UDM Downloads > CyberScrub KeyChain! Manage ALL Passwords with One Phrase. When you log on to KeyChain with your Master Pass Phrase you will have instant access to all of your password protected websites. Select your destination from a special list you have created- then simply "Click & Go". It's that easy! Each time you visit a site requiring a user name and password KeyChain auto enters this information and logs you in. It even prompts you to add these passwords to the program if you have not already done so. Never manually fill in credit card details again. Online shopping is a snap because KeyChain automatically enters your selected credit card details, Shipping and Billing address and more. All of your data is secured with strong encryption. Only you have access to the sensitive data within KeyChain. All information, including passwords, credit cards and other data, is protected with strong encryption algorithms. 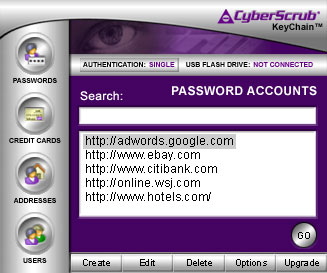 The USB flash drive also synchronizes with your host computer to back up your encrypted password list. This is an important feature should your PC crash or fail. You may also utilize the USB flash drive, if desired, for Dual User Authentication. This requires the user to not only enter the Master Pass Phrase, but also to plug the USB flash drive into their computer. Easy to use, backed award winning CyberScrub Customer Support.